It's every young boy’s dream to be a ninja warrior. Even though it doesn’t make for a very practical career choice, it is a fun character to try to imitate! It may even lead to some pretty cool skills such as roundhouse kicks and stealthy approaches! If you can see the value in your kid acquiring skills in wall scaling and barrel rolling and you're going to let your son practice being a ninja, then you better be sure to get him the right clothes for the job. After all, the clothes make the man, right? But a great ninja costume doesn’t have to break the bank - this affordable ninja costume is just what your kid needs to get their training started! 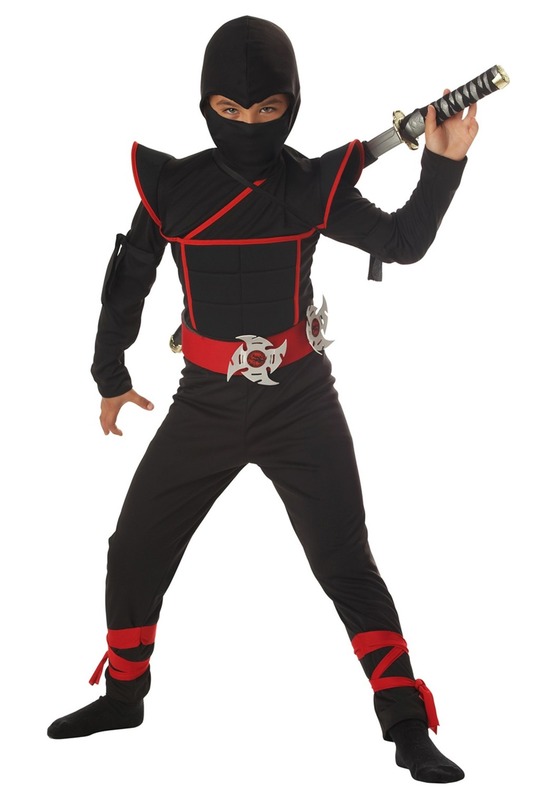 Your sneaky kid will feel like the ultimate ninja assassin in this stealth ninja costume! Major dreams will be fulfilled even if it's only for one night. This ninja costume comes with everything your child needs to bring that ultimate ninja character to life. The long-sleeve black hooded jumpsuit fastens with Velcro in the back for easy on and off. The polyfoam shoulder pauldrons and chest pad are edged with red binding and give it authentic ninja details. The sewn-on black fabric arms ties and red fabric ankle ties add something special to the costume while the red foam belt that fastens with Velcro and has Velcro dots for the included foam stars ensure that he or she is ready to take on the next enemy. Complete the look with the black fabric mask that fastens around the lower face to mask their true identity! The mission, if your child chooses to accept it, is to have a super sneaky Halloween! Well, there's no sneak attacking allowed when it comes to gathering the treats. Your child will have to knock on doors, despite their rigorous covert ops training. However, they can always be sneaky when it comes to finding their stash. Little do they know, when it comes to finding chocolate, mom and dad are in an S-class all their own! I have one very happy son - Thank you! The costume is okay. The fabric seems a bit thin, but it is comfortable, and my son loved the accessories. My son loved it. Great costume for Halloween. I am truly amazed at this costume. It is a quality costume at a great price. My son loves it and it fits him like it was made especially for him. I will shop here again. PS it shipped fast as well.